Feb 16, 2012: For the first half of this year's winter, the big news was warm temperatures and lack of snow. Ski resorts were covered in bare dirt, while January temperatures in southern California topped July highs. NASA climatologist Bill Patzert of the Jet Propulsion Laboratory explains what happened: "A couple of weeks ago, Mother Nature did an about face. The tight polar vortex that had bottled up the cold arctic air in the beginning of winter suddenly weakened. Cold air swept out of Siberia and invaded Europe and the Far East." 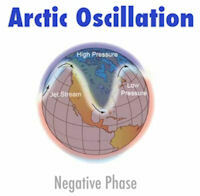 The "tight polar vortex" is caused by the Arctic Oscillation (AO), a see-sawing pressure difference between the Arctic and lower latitudes. When the pressure difference is high, a whirlpool of air forms around the North Pole. That’s what happened earlier this winter: the whirlpool was more forceful, corralling the cold air and keeping it nearer the pole. Now the vortex is weakening. With "the AO Index going negative," as an expert or weather-nerd might put it, cold air escapes from that whirlpool and heads southward, resulting in the killing extremes now plaguing the other half of the planet. 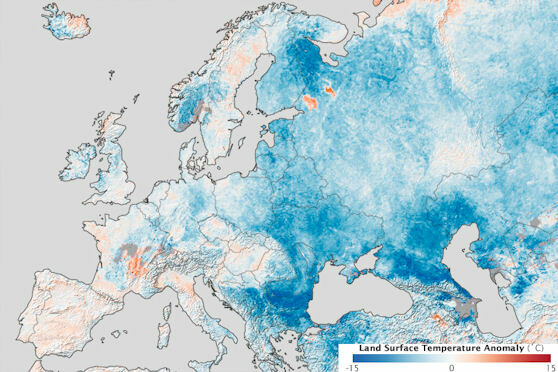 "Cohen's research is cutting edge and could bring important improvements to forecasting climate and weather over North America and Europe," says Patzert. "Cohen and others are on the threshold of understanding of how climate change affects the behavior of the Arctic Oscillation1." 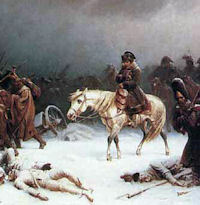 Patzert adds, however, that this winter is just one of many severe winters that have changed European history. "Looking back, Mother Nature has taken us on some very wild rides." "And let’s not forget the frigid winter of 1812, when Napoleon's Grande Armee was decimated by the extreme cold in Western Russia." "And the turning point of World War II occurred in 1941, when Germany’s forces were nearly frozen in place," he adds. There are many other examples2, and climate change can't be blamed for all of them. "There's always going to be some natural variability. Every episode of high temperatures or extreme cold isn't climate change. Sometimes it's just weather!" The weakening Arctic Oscillation could soon bring a return of winter to North America as well, although Patzert doesn't expect it to be as severe as what's happening on the other side of the Atlantic. "The good news is that this crippling cold snap arrived mid-winter. With the vernal equinox less than five weeks away, this AO episode will become muted – hopefully." 1To stress the complexity of the system, Tom Wagner, the Earth Science Division's Cryosphere Program Manager at NASA headquarters, notes "a new paper out by Chang in the Journal of Climate that talks about impact of the Indian Ocean on North America: The warming of the Indian ocean from global warming in turn causes warming of central US. There more to the story than diminished ice cover. We're dealing with a complex, interconnected system, and warming has unusual affects with teleconnections." Complicating matters further, there are also larger cycles superimposed, but that's another story. In 1310, a 20-year trend of cold weather was actually to blame for the Great Famine that began in 1315. And it probably had a lot to do with poor nutrition that made people more susceptible to the Black Death that struck in 1348. 1816 was the "Year Without a Summer" in the Northern Hemisphere. On July 4th that year in Savannah, Georgia, the high temperature was 46°F! There were food shortages due to crop failures and livestock deaths in the US, Canada, and Western Europe.